Despite their failure to achieve the commercial success of rivals like the Drifters, the Flamingos, or the Clovers, the Harptones demand consideration in any serious discussion of the truly immortal acts of the doo wop era. Although none of their singles cracked the Top 40, efforts like "A Sunday Kind of Love," "Life Is But a Dream," and "Memories of You" remain classics of the genre, distinguished by their rich harmonies and sophisticated, jazz-inspired arrangements. 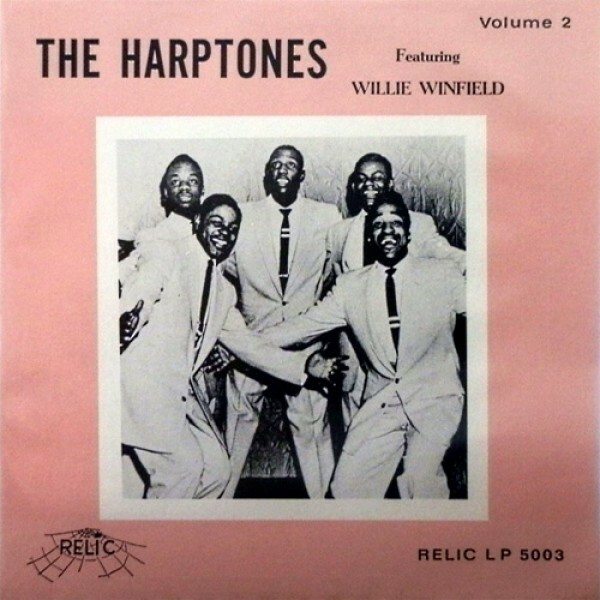 The Harptones' origins date to 1951 and the grounds of Harlem's Wadleigh Junior High School, where classmates William Dempsey, Curtis Cherebin, and Freddy Taylor began harmonizing as the Skylarks. Following the additions of Eugene "Sonny" Cooke and a classmate remembered only by the nickname "Skillum," the fledgling group made its professional debut via the Apollo Theatre's famed Amateur Talent Contest, performing a rendition of "My Dear Dearest Darling" that ended in the audience literally booing them off the stage. After a series of lineup shuffles, the Skylarks welcomed William "Dicey" Galloway, who concurrently served as a member of another fledgling Harlem doo wop unit, the Winfield Brothers. In early 1953, alumni of both groups combined as the Harps. Comprising tenor Dempsey, baritone Galloway, lead tenor Willie Winfield, first tenor Claudie "Nicky" Clark, bass Billy Brown, and pianist/arranger Raoul Cita, the Harps returned to the Apollo in November 1953 and earned top honors with their soulful rendition of the Louis Prima composition "A Sunday Kind of Love." Even more significantly, at the end of the evening an MGM Records executive in the audience invited the group to audition at the label's 1650 Broadway studio. When the Harps arrived at MGM's offices the following week, the exec in question was not available. To pass the time, the group practiced its harmonies while waiting in the hallway, attracting the attention of Bruce Records co-owners Morty Craft and Leo Rogers, who occupied an office just a few doors down. Craft and Rogers immediately extended a contract offer, and after altering the sextet's name to the Harptones (to avoid conflict with the Savoy act Little David Baughn & the Harps), Bruce issued "A Sunday Kind of Love" just days prior to Christmas 1953. Buoyed by Whitfield's crushed-velvet lead and Cita's otherworldly organ intro, the record proved a major hit throughout much of the East Coast, but spotty distribution effectively destroyed its chances of breaking nationally. The Cita-penned "Memories of You" followed in early 1954, and it too proved such a local smash that the Harptones were invited to appear at DJ Alan Freed's historic "Moondog Coronation Ball" alongside the Clovers and Charles Brown. Again Bruce's limited distribution network crippled the single's momentum, however, no doubt prompting the group to question the wisdom of passing up its shot with MGM. Clark assumed lead duties for the Harptones' third release, "I Depended on You." Whitfield reclaimed the reins for the 1954 effort "Why Should I Love You," copied virtually note for note by the Four Lads and placed on the B-side of their hit "Skokiaan," effectively obliterating the Harptones' original. When Dicey Galloway was drafted into military duty in the autumn of 1954, Cita handled baritone duties on the Harptones' fifth Bruce release, "Since I Fell for You." Another Tri-State region smash, it earned the group a spot on Freed's landmark first New York City showcase, 1955's "Rock and Roll Jubilee," alongside the Drifters, the Clovers, the Moonglows, and Fats Domino. But while Bruce's poor distribution again conspired to halt the single's chances at charting nationally, the Harptones remained under contract to the label, and after recruiting onetime Skylark Freddy Taylor, in March they issued a bluesy cover of Ivory Joe Hunter's "I Almost Lost My Mind." Two months later, however, Bruce finally collapsed, with Leo Rogers acquiring control of the company's assets. He shopped the Harptones to Old Town Records, with owner Hy Weiss agreeing to launch a new subsidiary, Paradise, to accommodate their arrival. After replacing Taylor with Bernard "Jimmy" Beckum, the Harptones cut their Paradise debut, the gorgeous Cita original "Life Is But a Dream." With its gossamer harmonies and jazzlike structure, the single ascended to the Top Five in New York, but Weiss spent little money on promotion outside of the East Coast and the record met the same grim commercial fate as its predecessors. The ballad "My Success (It All Depends on You)" closed out the year, coinciding with the Harptones' weeklong stint at the Apollo. It also marked the end of their Paradise tenure, and in the spring of 1956 the sextet resurfaced on Rogers' new Andrea imprint with the pop-inspired "What Is Your Decision." After recording three songs for the feature film Rockin' the Blues, the Harptones finally cut ties with Rogers, signing with George Goldner's Rama label to release "Three Wishes." Their first effort to feature new addition Harriet "Toni" Williams, it also heralded the return of Dicey Galloway. "On Sunday Morning" followed by year's end, and in early 1957 the group issued its third and final Rama single, "The Shrine of Saint Cecilia." An additional session was planned, but the night prior to entering the studio, 20-year-old Billy Brown died of a drug overdose. The session was canceled, but because the Harptones were contractually obligated to perform a date at Philadelphia's Uptown Theater, only Williams could attend Brown's funeral. His replacement was Skylarks co-founder Curtis Cherebin, whose arrival coincided with another week at the Apollo. After Rama dissolved, Goldner shifted the Harptones to his Gee imprint to issue the gritty ballad "Cry Like I Cried," their lone release for the label. Galloway exited the lineup soon after, and while the Harptones briefly forged on with erstwhile Solitaires lead Milton Love, the group split a few months later. But in early 1959 former Bruce exec Morty Craft came calling, convincing the group to reunite and sign to his fledgling Warwick label. This incarnation of the Harptones (Willie Winfield, William Dempsey, Nicky Clark, Curtis Cherebin, and Raoul Cita) cut "Laughing on the Outside" to little attention, returning that summer with "Love Me Completely." Their third and final Warwick effort, "No Greater Miracle," did not appear until May of 1960. By the time of its release, Clark had again exited, and was replaced by Hank Jernigan. In the fall of 1960 songwriter Billy Dawn Smith signed the Harptones to the Coed label for "Rain Down Kisses." When Smith assumed the helm of Coed's subsidiary Companion, he brought the group with him, releasing "All in Your Mind" (a riposte to Maxine Brown's hit "All in My Mind") in early 1961. With their second Companion single, "What Will I Tell My Heart," the Harptones scored their first and only national chart hit, squeaking to the number 96 spot on the Billboard pop countdown. But despite their brush with success, the group exited Companion, finally landing with MGM via its Cub subsidiary: the Otis Blackwell-penned "Devil in Velvet" marked the return of Jimmy Beckum, who replaced the outgoing Jernigan, but the record went nowhere and the Harptones did not resurface on record until early 1964, releasing the lovely ballad "Sunset" on the tiny KT imprint. When the single fell on deaf ears, a frustrated Willie Winfield finally threw in the towel. The remaining Harptones renamed themselves the Soothers long enough to cut a cover of the Johnnie Ray hit "The Little White Cloud That Cried" for the Port label before calling it quits by year's end. In 1970 Raoul Cita accepted an invitation to re-form the Harptones to play Rock Magazine's First Original Rock and Roll Revival show, recruiting Winfield, William Dempsey, Curtis Cherbin, and Jimmy Beckum to complete the lineup. The group continued to play doo wop revival events throughout the decade, and in late 1981 the current lineup (Winfield, Cita, ex-Fi-Tones member Lowe Murray, and Linda Champion) cut a new LP, Love Needs a Heart. Two years later, they backed longtime fan Paul Simon on his Hearts and Bones project. More than a half century following their debut recording, the Harptones remain on tour, with Winfield and Cita still charting the group's career.